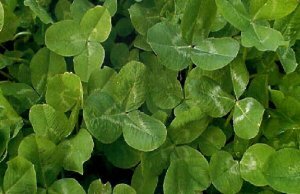 Frosty Berseem Clover is an extremely versatile tool to help extend the production in a thinning or declining alfalfa stand. Frosty Berseem Clover is not affected by the allelopathy (the chemical inhibition of one plant by another, due to the release into the environment of substances acting as germination or growth inhibitors) of Alfalfa, meaning that the synergistic relationship between the two is beneficial for producing a high yielding and high quality forage! When used as a cover crop, it is capable of fixing more than 150 lbs of Nitrogen per Acre. It also has a deep taproot that can break up a hard pan and recycle nutrients from deep within the soil profile and make those nutrients available for the following crop.